I've had the pleasure of visiting a handful of different apple orchards already this season and have noticed that the taste / quality of the cider has varied significantly thus far. Now I know there's been a lot of documentation done on the region's different cider donut offerings, but I haven't seen much of anything done on the cider itself. I was wondering if some of your readers could weigh-in with where their favorite local apple cider comes from. Bonus points if anyone has knowledge on how much the flavor changes from month-to-month or year-to-year based on what kinds of apples go into the mix. We've heard that the flavor of an orchard's cider can change over the course of the apple season as the different varieties of apples are harvested and added to the mix. But we can't say we've had a "Hey, wow, this cider is so much more (something) than it was last month" experience. Maybe you have. So, got thoughts on your favorite local cider? 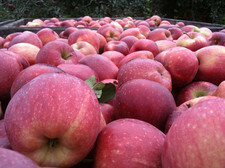 Or any insight on how the flavor of cider changes over the course of the season? Please share! I have similarly noticed a difference depending on where you get the cider, especially this year. My favorite hands-down has been from Lindsey's Country Store on Route 9 in Clifton Park. I think their cider is from Rexford, NY and it was like drinking a straight apple- perfectly tart and full of flavor, unlike other more-muted samples. Golden Harvest in Valatie! Amazing donuts, too. I can honestly say I've never had a bad batch of cider from this area....it's all good! I second Lindsey's Country Store cider. They use UV pasteurization which means they don't heat it up to kill the bad stuff. It's great! Saratoga Apple has the freshest cider I've ever tasted. It's a nice drive to Schuylerville too. Picnic in tow, we made stops at Locks 1 & 2, the Saratoga Battlefield and the Saratoga Monument. By the time we got to Saratoga Apple, a reggae band was jammin' (Sundays 2-5) and fresh apple everything could be smelled in the air. The cider donuts were perfect, the produce was gorgeous and there were bins and bins of pumpkins, squash and gourds. I had a chance to get cider from Saratoga Apple at the farmer's market at The Crossings of Colonie this past weekend. It was outstanding! Like Jamie said, super fresh! The donuts also were quite notable. I'll gladly seek them out in the future!